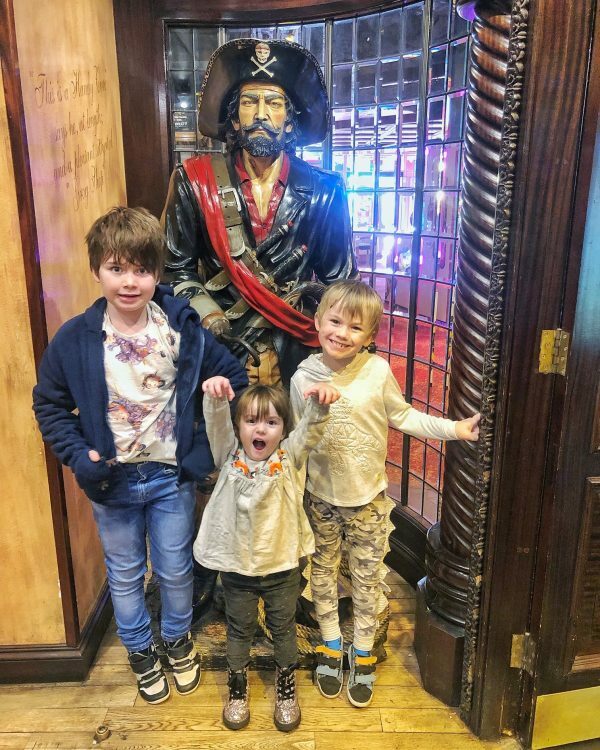 Last week we took a little trip over to Blackpool with the kids for an overnight stay during half term. I’m pretty conﬁdent that I have been to Blackpool, what with living only a few hours away, but I genuinely don’t remember it AT ALL. I couldn’t remember what the illuminations were like, I remember a trip to Pleasure Beach as a teen I think… but again, not well. 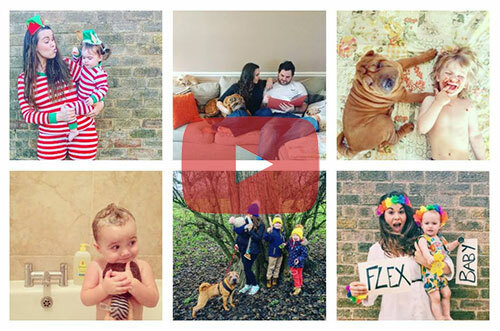 As for Adam, the last time he was in Blackpool was for his stag do, so with a wife and three small children in tow, you can imagine that this was a VERY diﬀerent Blackpool experience for him! 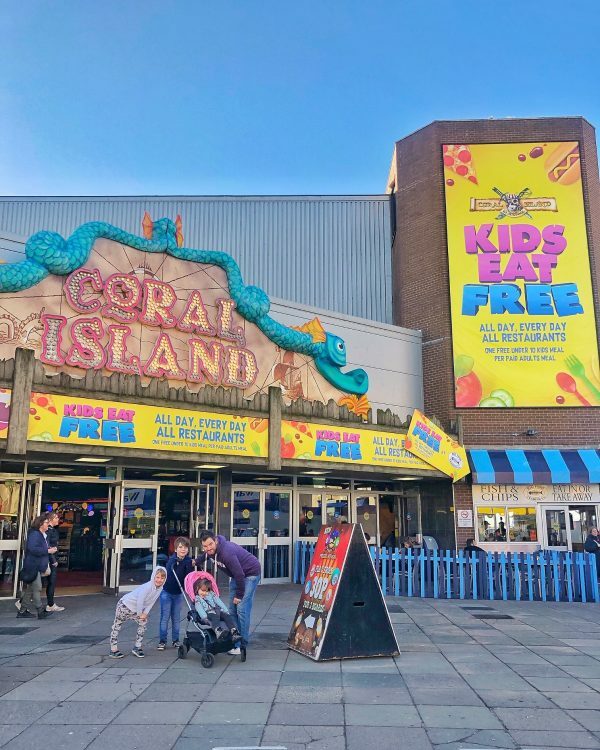 We were invited down to unleash the children on Coral Island, Blackpool’s largest free admission attraction and give an honest review of how we found our experience. Living only 30mins from Scarborough we have had our fair share of arcade experiences and the kids are positively wild for 2p machines, arcade games and the ﬂashing lights, so we thought they would really enjoy trying out Coral Island, and here is what we all thought, the good, the not so good and everything in between. tables together, which Adam eventually wet wipes himself as the staﬀ were so busy it was overlooked, and I went oﬀ to order our lunch. The way that the queues worked for The Buccaneer was a little bit bizarre, I joined a rather long queue to order only to be told you couldn’t order food from here, this was just drinks so I tootled over to a much shorter queue and ordered our food… to be told you couldn’t order drinks with food! You had to do it separately at the bar. By the time I had queued in two separate queues for food and drink and taken the drinks back to the table I had been at the other side of the restaurant for nearly 20mins. Whilst I don’t mind queuing and it’s great to see the place so busy, as a mum who has frequently taken her children out to these attractions alone whilst Adam was at work, this has really frustrated me. It would mean either ordering food and keeping the kids with me on the *hope* that we could ﬁnd a table – remember it was so busy we had to hover over a family who were leaving – or I would need to leave a 7, 5 and 3 year old on a table, alone, for 20mins. Whilst table service isn’t essential, I wouldn’t expect to have to queue in two diﬀerent queues for food and drink. We ordered Sirloin steak with peppercorn sauce for Adam with extras of bacon, mushroom and onion rings, and I ordered a garlic chicken. The kids had chicken nuggets and chips x 2 and macaroni cheese. 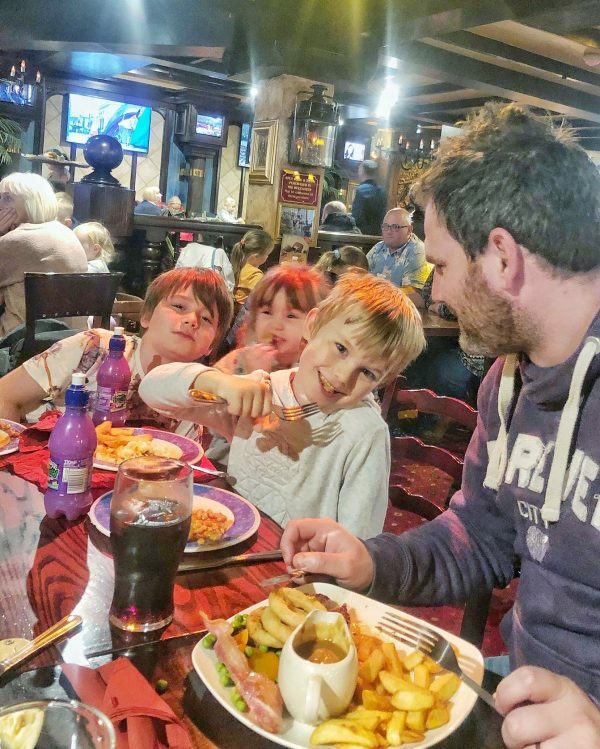 The whole meal came to £29.70 (not including the drinks) which we thought was brilliant – the children really enjoyed their food however mine and Adam’s was reﬂective of the price and we wouldn’t choose to order those meals again. Despite that, when I mentioned on my Instagram stories that we hadn’t had the best experience in The Buccaneer I received a few messages from followers telling me that The Buccaneer is brilliant for a Sunday Roast but they much prefer the ﬁsh and chip shop, which seemed to have the most recommendations and when at the seaside what else would you eat?! After our lunch we headed out to the arcade. We were very kindly gifted £40 to spend around the arcade to try out as much as we liked and we added £10 to this to give the kids chance to go on the grabbers. We didn’t win a single thing on the grabbers, despite picking the teddies up every time – the claw just clanged open at the top. Woe is us, but as is the grabber life amiright?! We bought tickets for the brilliant rides in the arcade, which are such a fab addition to the whole place, and it really sets it apart from a lot of places. Earlier on in the afternoon there was no queue but once the rain hit outside and families came in for shelter the queue was HUGE and took 35-40mins for Adam and Edith to get through. I’d recommend riding the rides ﬁrst – but don’t miss them, the little ones loved them. We took advantage of the many many arcade rides and games, from water blasting zombies to shooting a giant T-Rex in the Jurassic Park game. 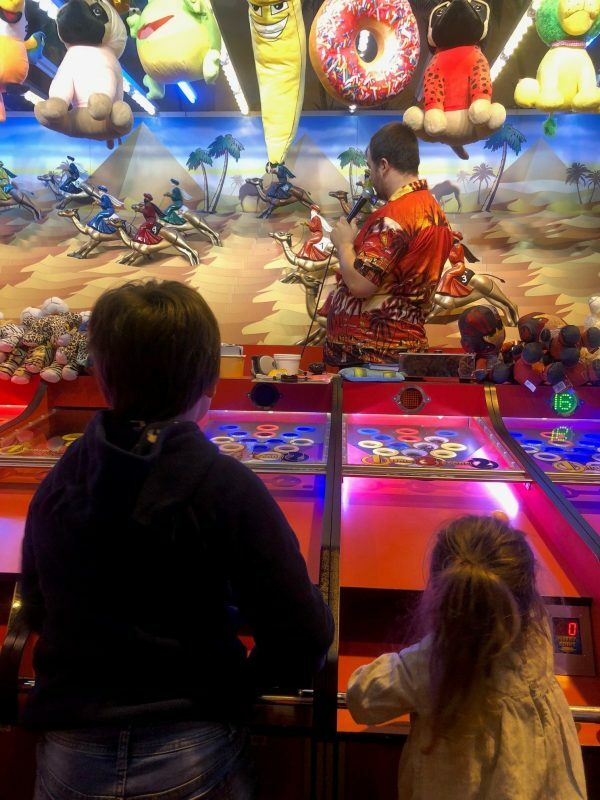 The boys thought it was brilliant but I will say that some of the machines that are meant to dispense tickets didn’t seem to do so and we only managed 70 tickets from our £40 – which gained us 2 refreshers each from the prize shop! Ha! This is the risk that you take with any arcade game though; so if you’re planning to earn loads of tickets, I think you are subject to spending a LOT, luck of the draw and your own talents on the arcade machines – and of course; them dispensing the tickets properly. I had loads of people message me to tell me that won BIG or that they walked away after an amazing afternoon of fun with coﬀee machines, mini fridges and even a professional drone! Don’t be put oﬀ by our lack of tickets but just be aware that there is a chance of spending quite a lot and getting a refresher! 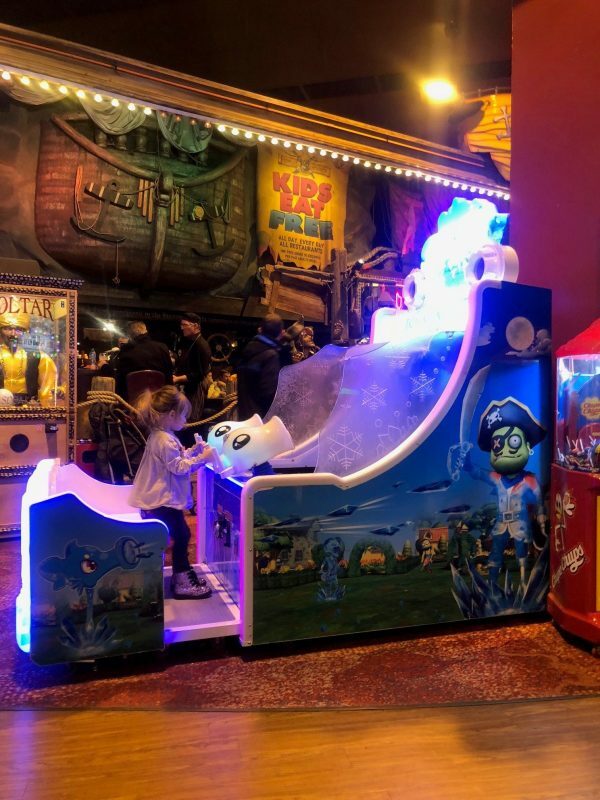 Toby’s favourite game, which he has talked about all break, was the Jurassic Park game, Reuben’s was the water shooter zombie game (which just cost us a FORTUNE – around £13 to do 3/4 of the levels) and Edith loved the race car with daddy and the Pirate ride. The camel race was another very popular one! If your budget doesn’t extend to much but you are looking for a bit of fun for an hour or two, I’ve always felt like arcades are a dangerous place to go as you inevitably spend a lot more than you plan to. With Coral Island there are so many 2p and 10p machines that £10 would go a long way for some fun.  If you would like to ﬁnd out a little bit more about Coral Island or if you’re planning on making a trip to Blackpool then you can do so here! Previous Post Abortion and Grief :: It’s ok to feel loss. Next Post How to make partridge in a pear tree Christmas door decorations!